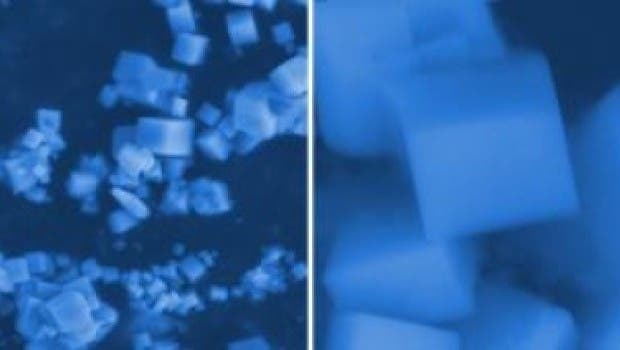 Hydrogen may soon become far easier (and safer) to store, thanks to the development of a new class of ceramic materials by researchers at the University of California, San Diego. The new materials are composed of a mixture of calcium hexaboride, strontium, and barium hexaboride — this is the first time that such compounds have been made. Importantly, these new compounds can be produced using a rather simple and low-cost method — combustion synthesis. The researchers have created for the first time compounds made from mixtures of calcium hexaboride, strontium and barium hexaboride. From left: Scanning electron microscope image of hexaboride structure at the 5 micron scale; image at the 500 nanometers scale. One of the great advantages to the (potential) use of these new materials is that they can be manufactured faster and cheaper than the materials currently in use can be. The research is still in the proof of concept stage, though, so some unknowns remain. The work is a collaboration between UC San Diego, Alfred University in upstate New York and the University of Nevada, Reno. The resulting ceramics are essentially crystalline structures in a cage of boron. To store hydrogen, the researchers would swap the calcium, strontium and boron with hydrogen atoms within the cage. Engineers mixed boron with metal nitrates and organic fuels, such as urea, in a box furnace at temperatures below 400 degrees Celsius — roughly 750 degrees Fahrenheit — cooler than a commercial pizza oven. The nitrates and organic fuels ignite, generating heat that then drives the reaction without the need for an external source of power. This method is known as combustion synthesis. “It’s a very simple, nice process,” Graeve noted.